While I hope everyone enjoyed a beautiful memorial day weekend, there's no rest for the wicked, at least not until the Ring is over in September. Our cast and crew worked through the long weekend -- well, they took a break on Sunday -- and were proud to get a shape worked out for the dreaded Rheingold Scene Two. 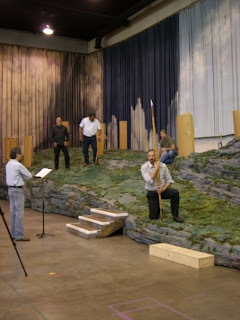 Left, Director Stephen Wadsworth studies the placement of Wotan (Greer Grimsley, with spear) while Loge (Kobie van Rensburg, in black), Donner (Gordon Hawkins, with ax) and Froh (Jason Collins, crouching) hang out. Rhinegold Scene Two is a particularly challenging scene because it introduces eight wild mythological characters and features a huge amount of exposition of the world where this story takes place and the plot. It's also none too short, and Tom Lynch's beautiful Forest Ledge set isn't the easiest place to stand for hours on end. Yet in its previous incarnations, this scene proved a great success, probably because Stephen Wadsworth has organized it as a courtroom drama. (That's exactly what it is, although many directors lose track of that fact, caught up in the strangeness of the world being revealed.) Wadsworth is a favorite of Seattle audiences both for his ability to tell a story about real people clearly and for his strong stage pictures. Below, Loge (Kobie van Rensburg) is in position to tell Wotan (Greer Grimsley) how the giant Fasolt, who's just exited, has Freia slung over his shoulder. 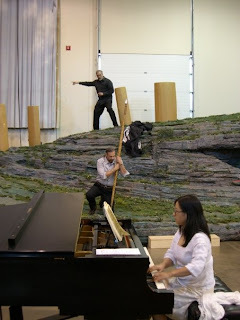 Justina Lee has to be at the piano for all the rehearsals...but at least she doesn't have to stand on that crazy Forest Ledge!